Each rare book and every archival collection holds a story. Manuscripts and artifacts bear witness to past events, but only a careful researcher can piece together the facts of history and reveal the narrative within the collection. VCU Libraries Special Collections and Archives houses many fascinating rare books and primary source materials that wait for inquisitive minds to study them. This exhibit presents materials related to this year's VCU Common Book --The Secret History of Wonder Woman--that we believe merit further research. We hope that reading the Common Book will set you on your own research journey. You too may find that when you take "history in your hands" you begin the process that will allow the full story to be shared. 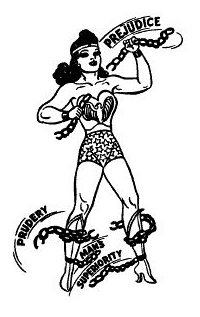 Image from William Moulton Marston, "Why 100,000,000 Americans Read Comics" The American Scholar, 1 December 1943, Vol.13(1), pp.35-44. Special Collections and Archives at James Branch Cabell Library is home to rare and valuable books, manuscripts, book art, and comic arts. Materials from the collections do not circulate but are available for use in our Reading Room on the fourth floor of Cabell Library, Monday - Friday, 9 a.m. to 5 p.m.